Its early and I’ve been up awhile but I have a reason which I’ll get to as part of my exciting news this post ! First off stitching or lack there of, my bug is gone on holidays ! I think its sitting in a lounger beside the sea relaxing and enjoying itself as it sure isn’t here with me ! I am supposed to be working on Hogwarts Crest to get it done in time for James birthday but that’s just not going to happen, sad but hey that’s sometimes how things go. I have cast on a beanie hat for him which he’s into wearing at the moment so he will be getting a handmade gift, just not the one originally planned. This is where I am at with Hogwarts at the moment. Hogwarts Crest where it stands at the moment. I also mentioned last week a piece I was designing myself from a quote from a movie. Well I can show you what I have done so far, its not quite finished and needs a little more added to it. 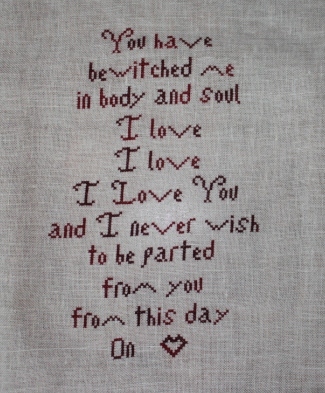 I’ve stitched this on 28 ct flax with Belle Soie Cranberry and I’ve done it in a style to match in with my other pieces on my Pride and Prejudice wall. Not even this exciting piece is enough to tempt my bug back so I shall give it a holiday and hopefully it will come back plenty rested and ready to go again. In the meantime I am knitting and knitting lots so I shall have updates, hopefully not to boring. Now I did mention something about exciting news didn’t I ! … mmm this year has been eventful to say the least as some of you know and then you get thrown a curve ball and it turns out to be most exciting. Sometimes things happen for a reason and because they are needed even if you don’t think you need them ! OH yes the news, I guess you want to know now don’t you…or maybe you don’t lol..
We are expecting a baby ! Wow what a surprise this was but a most wonderful surprise and blessing. All is good thankfully and we will continue to pray that it is. We have had our scan and we have seen the baby. No we won’t be finding out if we are having a boy or girl, we didn’t with the others so we are not going to change that we will wait for the surprise at the end. The whole house seems to be so much lighter and happier now in spirit than it has been so far this year ! The children are excited and it is quite infectious. Oh yes due date, we have the coolest date ever ! I know babies don’t come on their expected date but I sure am going to enjoy saying this due date, baby is due on the 12/12/12…told you it was cool ! Ok I think that’s enough news for now lol, Sunday I’ll be back with a YOP project post and I do have lots for my week to show everyone, so check back in then, even if your not a knitter lol. 25 Responses to EXCITING NEWS !! Congrats on your fantastic news! Wow! A HUGE congrats to you! I hope you have a hassle free pregnancy! I wish you all the best and happiness!Hogwarts is looking great sometimes projects just don't want to be finished on time and that's the way of things.Love the quote you've stitched up! Congratulations Ruth. That is wonderful news! Congratulations to you and your family. Babies are so precious. Wow! Congratulations! What a fun due date, too! Now you'll probably be looking for a baby announcement to stitch instead of the rest of the CJC designs. Amazing news, many many congratulations! What fantastic news! A new addition to the ohana. Ho'omaka'i!The crest is lookin' so awesome! Thanks for finding the link for me. I'm so happy for you and your family. What a blessing. Congratulations! Well, seems entirely appropriate to be congratulating you while making YOUR biscuits! Congratulations, Ruth, keep well.Those biscuits go down a treat at church functions and I am refusing to pass on the recipe until we leave to return to the States, lol! Can't have anyone else bringing them! It is a dreary, rainy Friday in Cheshire but brighter for your news! Now how do you expect anyone to comment on your beautiful stitching when you drop that one in on the end of the post? 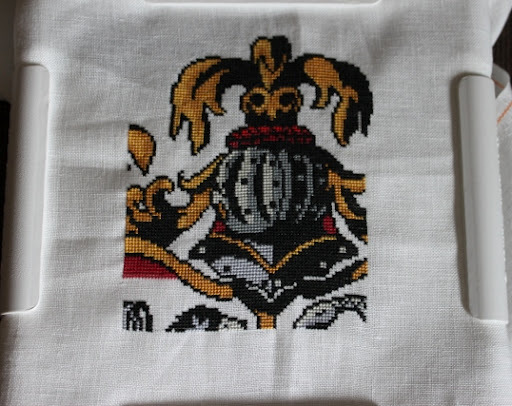 !Brilliant news…..so very pleased for you all!BTW- beautiful stitching!